Well, we’ve learned a few things through the years, like getting to the Fairgrounds earlier. Paul Goss has filled the show containers on the previous day. Otherwise, the more things change, the more they stay the same. 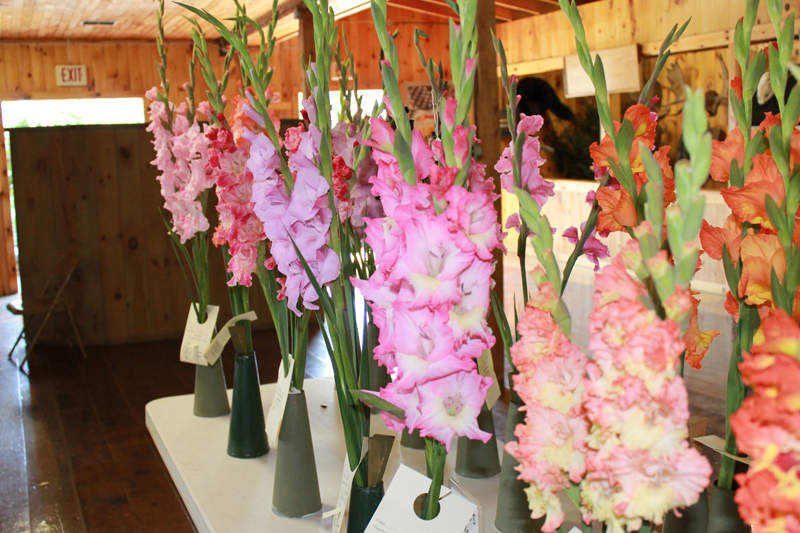 Our 2012 show was dedicated to Madeleine Walenta, the founder of the Maine Gladiolus Society. A glad with her name is pictured in this issue of “The Glad Book,” and a color version is available to view on the MGS website. The bulbs of this glad will be available when stock is sufficient, probably 2014. In Class 1, “Novice,” no entries. In Class 2, “Boys and Girls,” Nicholas Cates took first place with The King’s Kisses (475), and Ethan Cates took second place with Jeanie Blue (385). There were no entries in Class 3, Section I (100 size, single spike open competition). 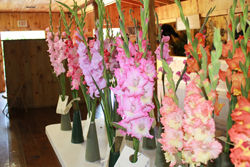 In Section II, a Cates family spike of Super Cross (237) took best in class, with runner-up Muriel (211), exhibited by the Moshers. The Moshers’ Lady Lucille (345) took best in class for Section III, and Sal Bonfanti’s spike of King’s Gold (302) was runner-up. For 400-size spikes in Class 3, Section IV, the Moshers took first and second place with Cloud 9 (435) and Orleans/Video (472), respectively. In Section V (500 size), a Mosher-grown Rose Beauty (563) took first place, while a Cates family Bud Zdorov Druzhok, meaning “To Your Health, My Friend,” (553) took second. In the seedling section Class 3 (Section VI), Cates-grown spikes took first and second, with Cates seedling 12 F judged best in class and John Meyer seedling H 10 as runner-up. In Class 4, the three-spike competition, Cates-exhibited Inca Chief (427) was best in class, while another Cates three-spike, Ebony Beauty (358) was runner-up. There were no entries in Class 5 (All-America). 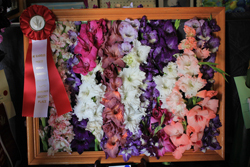 As for the Old Timers (Class 6), a Cates-exhibited True Love (444) took best in class, while Green Beret (304), also brought by the Cates family, was runner-up. As for People’s Choice, a Cates-shown Candy Cane took home the rosette, although a spike of an unknown variety from the Moshers came in a close second. The voting was difficult for some — one show visitor wrote on their ballot, “Love your show every year! 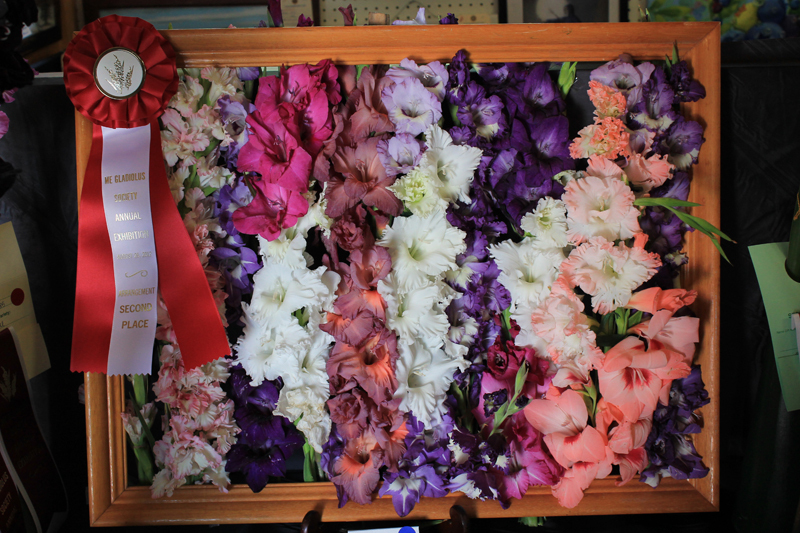 All beautiful!” Grand champion of the show was Super Cross (237) and reserve champion was seedling 12 F, both from Cates. In 2011 we were in a rather desperate situation regarding the design show. Members of a local garden club had done most of the designing in the past, but could no longer be involved. What to do? Up stepped “Super Lady!” — Arthur and Joyce Mosher’s daughter-in-law, Vicky, from the Maine country town of Liberty. 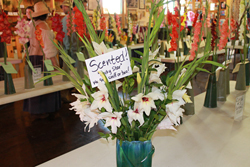 Her experience in floral designing was limited, but we knew when she arrived at the exhibition hall with very interesting design accessories related to the 2011 theme “The Seasons of Maine,” that we were in for a treat. (She had a muddy boot to include as part of her design in the “Mud Season” category.) Her delightful designs simply dominated. In 2012, with the theme “Windsor Fair,” she did it again! We need to give Vicky more competition. At least we made a start in this direction in 2012 — Laura Jane Foote, Margaret Cates, and Helen Cates all had runner-up ribbons. Laura Foote won first prize in the Designer’s Choice section. Come on folks, we can do better than that! Here’s an opportunity to compete against a real champ! A special thanks to Vicky for saving our design show, two years in a row!